” Around 55% of women in the targeted age group of 50–74 participated in the BreastScreen Australia in 2015–2016 with more than 1.7 million screening. Breast cancer mortality has decreased since BreastScreen Australia began from 74 deaths per 100,000 women aged 50–74 in 1991 to 44 deaths per 100,000 women in 2015. 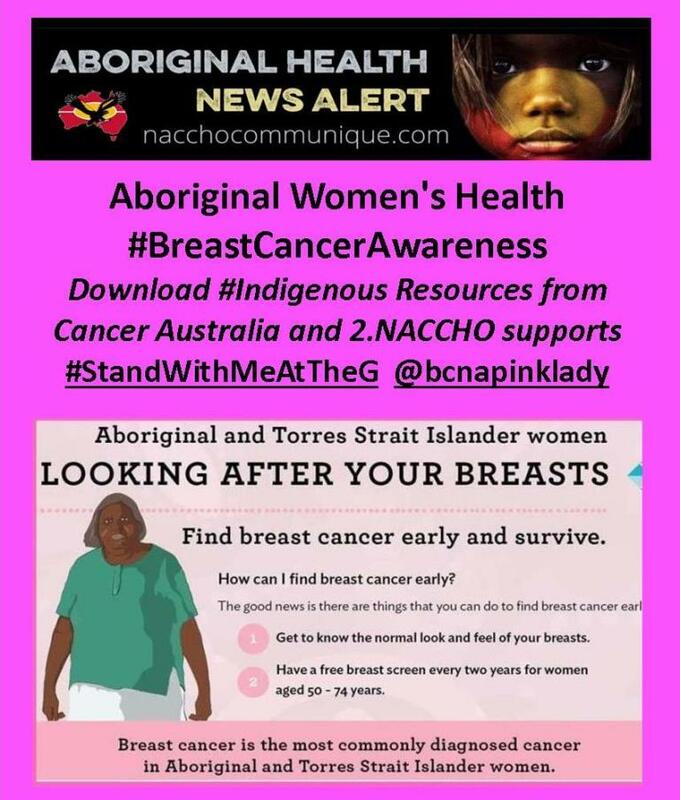 Aboriginal and Torres Strait Islander women of Australia, hereafter respectfully referred to as Indigenous women, experience a high burden from breast cancer. While Indigenous women experience a lower age-standardised incidence rate of breast cancer than non-Indigenous women (rate ratio of 0.9; AIHW 2017c), breast cancer is still the most common cancer diagnosed in Indigenous women. 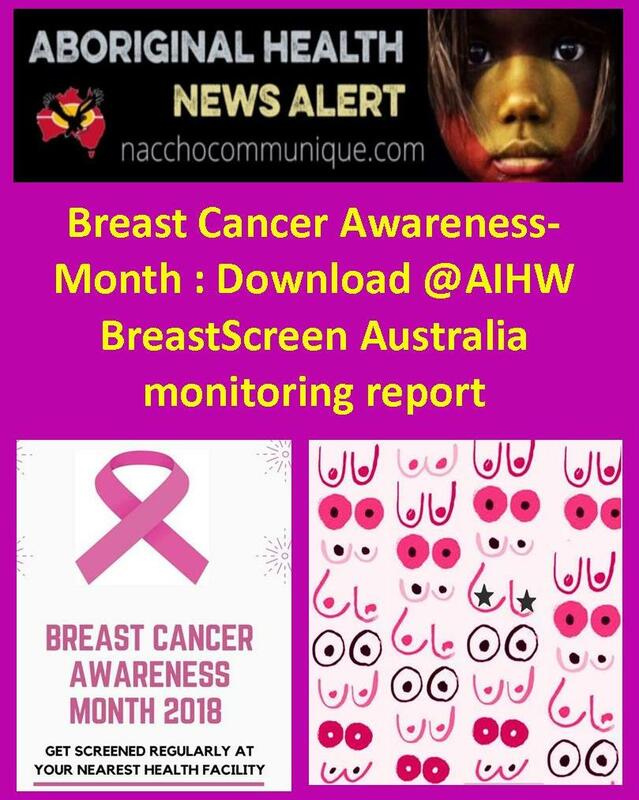 Aspects of breast cancer and breast screening in Indigenous women are reported by the AIHW and others in various reports and publications, but considering these data individually is not as valuable as considering all available data collectively. This chapter therefore brings together the BreastScreen Australia participation, incidence and mortality data that previously appeared in several places in this report, and supplements these with additional analyses on incidence, survival and mortality, as well as incorporating data and findings from other published sources. Indigenous status of women who participate in BreastScreen Australia is self-reported by women at the time of their screen. 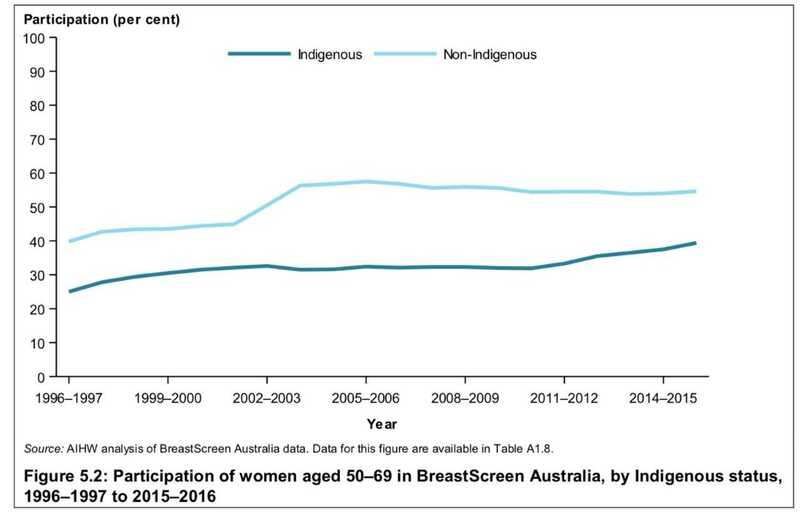 In 2015–2016, participation of Indigenous women aged 50–74 in BreastScreen Australia was 39.1%, compared with the non-Indigenous rate of 54.3% (age-standardised). Participation trends for Indigenous and non-Indigenous women are shown in Figure 5.1. Historical Indigenous participation rates have been recalculated using new Indigenous population estimates so that meaningful comparisons between reporting periods can be made (see Box 5.1). Trend data show that the participation rates in Indigenous women aged 50–69 have increased, from around 32%–33% for all reporting periods between 2001–2002 and 2011–2012 to 38% in 2014–2015 and 39% in 2015–2016—although Indigenous women have always had a lower participation rate than non-Indigenous women (Figure 5.2). Lower participation of Indigenous women may reflect a decreased opportunity to screen, compared with non-Indigenous women, and/or different screening behaviour of Indigenous women (that is, being less likely to screen even with the same opportunity to do so). There may also be a level of under-reporting of Indigenous status in BreastScreen data (as Indigenous status is self-reported by women at the time of their screen), which would also have the effect of lowering the apparent participation rate. This is because under-identification of Indigenous women in BreastScreen data would reduce the size of the numerator without affecting the denominator. 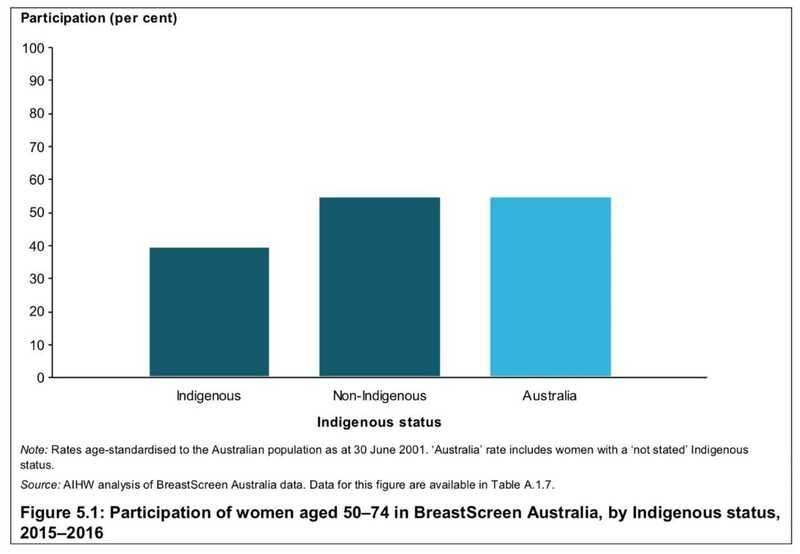 Source: AIHW analysis of BreastScreen Australia data. Data for this figure are available in Table A1.8. This report uses Indigenous population estimates based on the 2011 Census, which were the most recent estimates available at the time of preparation of this report. New Indigenous population estimates were released by the ABS in 2014 based on the 2011 Census. These estimates included backcasts of the Indigenous population, as well as population projections to 2026. The backcast estimates of the Indigenous population were considerably larger than those previously published based on the 2006 Census. This is in part due to improvements in Census coverage and enumeration of Indigenous Australians in the 2011 Census, and an increased likelihood that individuals identified themselves and their children as Indigenous. Historical Indigenous participation rates have been recalculated using these new Indigenous population estimates so that meaningful comparisons between reporting periods can be made over time. Rates presented in this report should not be compared with previously published rates that used population estimates based on the 2006 Census. Results of a recent Queensland project, ‘Closing the Gap in Breast Cancer Screening’, suggest that different screening behaviour of Indigenous women may play a significant role in their lower participation rates. This project aimed to address barriers to screening for Indigenous women through culturally appropriate messages, art shows and partnerships with local Indigenous groups, in order to build trust, educate and support Indigenous women to attend BreastScreen Australia. The project reported an increase in Indigenous participation from 49% to 56% in 2 years. Initiatives such as these are common to state and territory BreastScreen programs. These strategies and initiatives are designed to be culturally sensitive and appropriate to the knowledge, attitudes and beliefs of Aboriginal and Torres Strait Islander women. They include dedicated and appropriate communication resources, group bookings for Indigenous women who would prefer to attend as a group, and the use of Indigenous artwork. BreastScreen workers liaise closely with Aboriginal Health Workers and Aboriginal and Torres Strait Islander community groups to increase acceptance of screening. In the last quarter of 2014–15, the Australian Government ran the National BreastScreen Australia Campaign to support the expansion of the program to women aged 50–74. The campaign included additional communication activities for Aboriginal and Torres Strait Islander consumers, with materials developed in consultation with Aboriginal and Torres Strait Islander women. Access to BreastScreen services for Indigenous women is a national policy feature of BreastScreen Australia, which has developed National Accreditation Standards (NAS) Measures to ensure that this policy feature is met by services accredited through BreastScreen Australia (see Box 3.3 for more information on NAS Measures and accreditation). These NAS Measures, along with other NAS Measures related to access and participation in BreastScreen Australia, underpin BreastScreen Australia’s aim to maximise the proportion of women in the target population who are screened every 2 years. Table 3.1 shows the NAS Measures related to participation. information from additional sources, such as hospital records and death records, which allows for information on Indigenous status to be collected where possible. The level of identification of Indigenous status in the ACD for the period 2009–2013 is considered sufficient to enable analysis in 5 jurisdictions, with data from New South Wales, Victoria, Queensland, Western Australia and the Northern Territory. While the majority (89.9%) of Australian Indigenous people live in these 5 jurisdictions, the degree to which data for these jurisdictions are representative of data for all Indigenous people is unknown (ABS 2012). 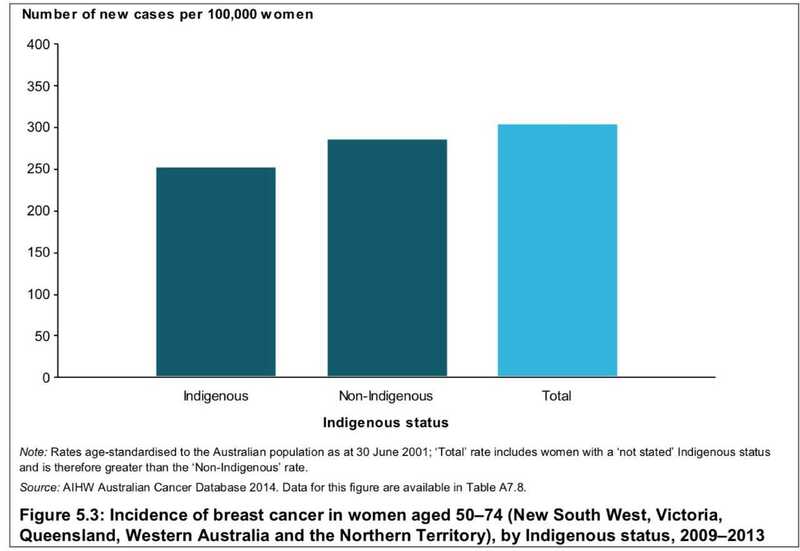 Analysis of data from these jurisdictions showed that, in 2009–2013, Indigenous women aged 50–74 had a lower incidence rate of breast cancer, at 251 new cases per 100,000 women, compared with 285 new cases for non-Indigenous women (Figure 5.3)—with a similar trend for all ages (99 compared with 111 per 100,00 women). Note: Rates age-standardised to the Australian population as at 30 June 2001; ‘Total’ rate includes women with a ‘not stated’ Indigenous status and is therefore greater than the ‘Non-Indigenous’ rate. Source: AIHW Australian Cancer Database 2014. Data for this figure are available in Table A7.8. Crude survival was also calculated, and found to be lower for Indigenous women, compared with non-Indigenous women—crude survival was 73.7% for Indigenous women of all ages, compared with 84.3% for non-Indigenous women of all ages during the period 2009–2013. Similarly, crude survival was lower in Indigenous women when restricted to women aged 50–74 (75.4% compared with 89.0% for non-Indigenous women). The source of mortality data is the AIHW National Mortality Database, in which information on Indigenous status is considered to be adequate for reporting for 5 jurisdictions: New South Wales, Queensland, Western Australia, South Australia and the Northern Territory. 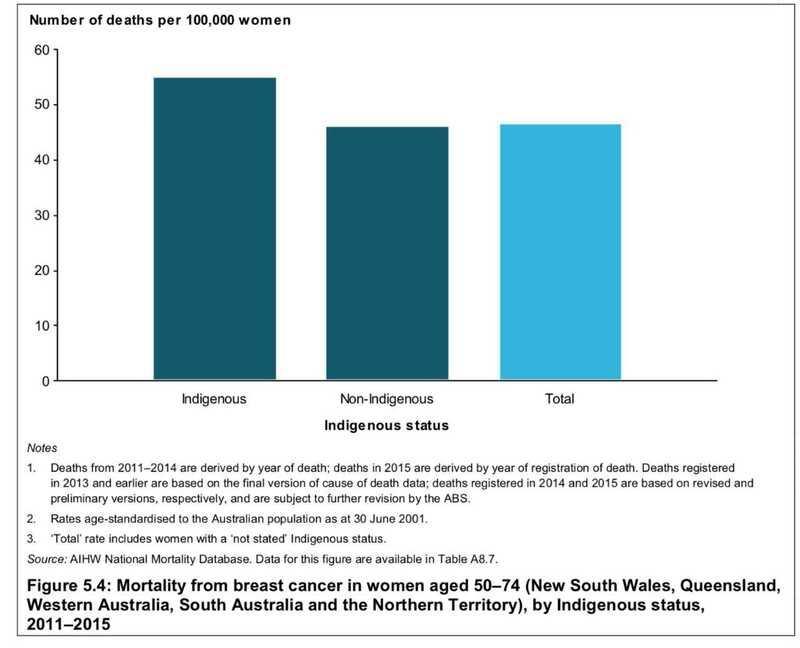 In 2011–2015, the mortality rate from breast cancer was higher in Indigenous women aged 50–74, at 55 deaths per 100,000 women, compared with 46 deaths for non-Indigenous women (Figure 5.4). While participation in BreastScreen Australia has a direct effect on the incidence of breast cancer, additional factors come into play for mortality from breast cancer, such as the stage of cancer at diagnosis, and access to treatment.